Charles Brandon, Duke of Suffolk, long-time boon companion of Henry VIII cuts a dashing figure; ever present, ever loyal and one of the few of Henry’s intimates that lived to die a natural death. Across the centuries, he intrigues; the commoner who rose to be one of the most powerful men in the land, both a gallant gentleman and a ruthless servant of the king. But where might we, as time travellers, get close to his story? Tattershall Castle and Charles Brandon’s history are intertwined. Here we find out more. As you will hear, the castle was granted to Brandon as a base from which to suppress the uprising in Lincolnshire, which latterly became known as The Pilgrimage of Grace. Perhaps a little more off the beaten track than most Tudor locations, it is worth the effort for its poignant connection to a time of great upheaval in England and its close association with the charismatic Charles Brandon. Today we have a guest author post by Sarah Bryson, author of La Reine Blanche, to tell us more about Tattershall Castle and Charles Brandon. So, now it’s over to Sarah. 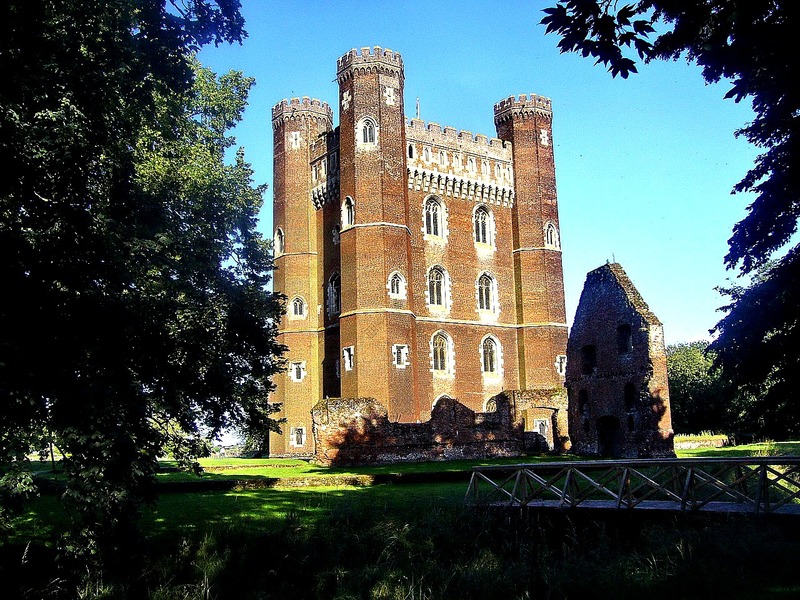 The magnificent, deep red tower of Tattershall Castle can be seen from many miles away. Located in Lincolnshire, around two hundred and fifty yards from the village of Tattershall, the castle was built by Lord Treasurer, Ralph Cromwell, between 1434-1443 and, thus, has a relatively short history compared to some of the other castles in England. Born in 1393, Cromwell was a self-made man who served the Duke of Clarence, and notably Henry V, in France. His marriage to Margaret Deincourt, a wealthy heiress, brought his income up to a staggering £5000 a year. Between 1433 and 1443, he was the Lord Treasurer of England and needed a dwelling to suit his illustrious position. There has, in fact, been a building at Tattershall since 1231, when Robert de Tattershall built upon the land. However, between 1434-1447, Lord Cromwell extended these original buildings and then built an imposing red-brick tower on the edge of the bailey. This tower is known today as Tattershall Castle. The original castle was heavily defended. To gain entrance, you would have needed first to pass through a gate house and then over the outer moat to enter the outer bailey. Another gate house spanned a second, inner moat which led into the inner bailey, the keep, castle and other buildings, including a series of kitchens. Unfortunately, these protective gatehouses no longer exist. The central tower, shown clearly in the image above, stands at over one hundred feet high and has thick, imposing walls built from deep, red brick; its height and location allow for an uninterrupted view of the surrounding area (see image below). This tower was rectangular in design and five stories high, with a basement and four imposing towers at each corner. It is estimated that over a million bricks were made for the construction of the building. Whilst all were made locally, the bricks were fired by foreign craftsmen. Inside the castle, the first floor of the tower consisted of a magnificent hall. This was designed not only to welcome visitors, but also to impress upon them the wealth and power of Lord Cromwell; you can see his personal motto and crest prominently displayed over several fireplaces. One of the internal rooms of the castle; notice the grand fireplace emblazoned with coats of arms and the bear walls, which would once have been hung with tapestries. Cromwell died on 4 January 1455, without a male heir. He left only two nieces, daughters of his sister, as his heiresses. It is unclear as to who was granted the castle at Tattershall, although it is possible that it reverted to the Crown as, in 1487, King Henry VII granted Tattershall to his mother, Lady Margaret Beaufort. Upon Lady Beaufort’s death it appears that the castle came back into Crown hands; that is until 4 April 1537. In October 1536, rebellion broke out in Lincolnshire. The uprising began as a series of revolts by the people of Lincolnshire, unhappy with the dissolution of their abbey in Louth. There was great anger at Thomas Cromwell’s commissioners, who carried with them instructions to inspect some of the smaller monasteries in the region. Rumours were widespread that the jewels, plate and wealth of the monasteries would be confiscated and new taxes imposed upon the people. When the rebels met at Lincoln Cathedral several days later, reports suggest that they had somewhere between 10 000 and 20 000 men who had taken up arms. This was to be the biggest rebellion during Henry VIII’s reign and was only suppressed following a series of promises by the king, however, many of these were never kept and over a hundred rebels were ultimately executed. In an attempt to secure Lincolnshire, and to ensure no further rebellions broke out, Henry VIII granted Tattershall Castle to Charles Brandon, Duke of Suffolk on 4 April 1537. “Charles, duke of Suffolk. Grant, in tail male, of the castle, lordship, and manor of Tatishall alias Tatyrishall, Linc., with all lands, &c., in Tatishall, Conysby, Kyrkeley super Bayteyn alias Bayne, Thorp, Stratton, Langton, Marton, Roughton, Tomby, and Toftnewton, Linc. ; with court leets, views of frankpledge, &c., and a ferry on the water of Withom in Tatishall”. (Letters & Papers Vol. 14 1103). The king ordered the duke to set up his main place of residence in Lincolnshire; thus Tattershall Castle and Charles Brandon became inextricably linked. The duke used Tattershall as his base of operations, which were to oversee the protection of Lincolnshire. After Brandon’s death, the castle was bequeathed to his son and heir, Henry Brandon. However, both Brandon’s sons would die on 14 July 1551 of the sweating sickness. Without any heirs of his own, Tattershall Castle once more reverted to the Crown. Then, on 5 September 1551, King Edward VI granted Tattershall Castle to Edward Clinton, 1st Earl of Lincoln. The castle remained in the Clinton line until the death of Theophilus in 1692. He had no male heir, so the estate then passed to Theophilus’ cousin, Bridget. It remained with her descedents until the early twentieth century. Unfortunately, in the eighteenth century many of the smaller buildings attached to the great tower were demolished. However, in 1910 the castle was purchased by Lord Curzon. Curzon went on to restore much of the red brick tower, including purchasing and restoring several fireplaces that had previously been removed from the building. If you wish to find out more about any of those properties, they are included in In the Footsteps of the Six Wives of Henry VIII. If you wish to read about another of Charles Brandon’s properties, follow this link to an article on Westhorpe Hall in Suffolk. Sarah will be giving a talk at the castle at 6:30pm on Saturday 11 August 2018. Here’s the link on the National Trust website if you would like to find out more information. Castle Opening: 11:00am – 5:00pm on selected days of the year. Please check the website for further information on which days the castle is open. Sarah Bryson is a researcher, writer and educator who has a Bachelor of Early Childhood Education with Honours. She currently works with children with disabilities. She is passionate about Tudor history and has a deep interest in Mary Tudor, Charles Brandon, Duke of Suffolk and the reign of Henry VIII and the people of his court. She has run a website dedicated to Tudor history for many years and has written for various websites including ‘On the Tudor Trail’ and “QueenAnneBoleyn’. She has been studying primary sources to tell the story of Mary Tudor for a decade. Sarah lives in Australia, enjoys reading, writing and Tudor costume enactment. Sarah’s most recent book about Mary Tudor, Queen of France called La Reine Blanche; Mary Tudor, a Life in Letters can be purchased here (UK) or here (US). A Topographical Account of Tattershall in the County of Lincoln, viewed 30 July 2015, <https://books.google.com.au/books?id=zQ4HAAAAQAAJ&source=gbs_navlinks_s>. Johnson, M 2013, Behind the Castle Gate: From the Middles Ages to the Renaissance, Routledge, London. Pettifer, A 2002, English Castles: A Guide by Counties, Boydell & Brewer, Suffolk. Pevsner, N & Harris J, 2002, Lincolnshire: The Buildings of England, Tale University Press, London. Tattershall Castle 2015, National Trust, viewed 30 July 2015, <http://www.nationaltrust.org.uk/tattershall-castle/>. Winterman, D 2013, The man who demolished Shakespeare’s house, BBC News Magazine, viewed 30 July 2015, <http://www.bbc.com/news/magazine-21587468>.